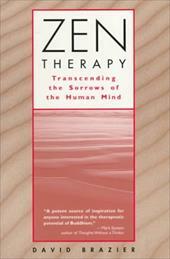 "A potent source of inspiration for anyone interested in the therapeutic potential of Buddhism. David Brazier writes with clarity and authority about the Zen way. "—Mark Epstein, M.D. author of Thoughts Without a Thinker: Psychotherapy from a Buddhist Perspective. "Comprehensive and readable . . . should appeal to anyone broadly interested in Buddhism. "—Helen Sieroda psychosynthesis psychotherapist. In this book, psychotherapist David Brazier offers readers in the West a fresh perspective on Buddhist psychology and demonstrates how Zen Buddhist techniques are integrated into psychotherapy. Writing from the viewpoint of a Western psychotherapist, Dr. Brazier successfully demystifies Buddhist psychology, explains the conceptual foundations of Buddhist thought, and with the help of vivid case studies, clearly demonstrates how a Buddhist approach can provide a practical path to personal growth.